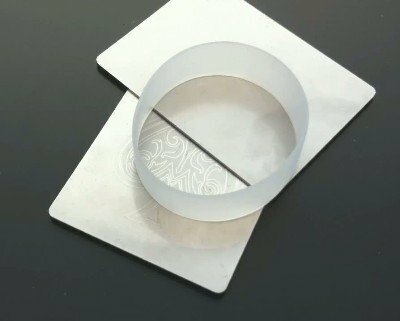 Shuber Blades are the new versatile and cool accessory for the modern card magician. They protect your cards like a card clip or card guard, but are not limited to a single deck of cards. Anything from a single card up to two decks can be protected equally well. Shuber Blades are two sturdy stainless steel plates with size and shape equal to a Poker card. Put one plate at the bottom, the other at the top of your deck and secure everything with the custom rubber band. 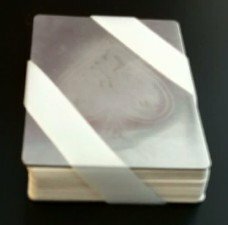 The plates will protect your cards and keep them flat and clean. You can protect anything from a single card, or small packet trick all the way to a full deck plus additional cards up to two decks stacked on top of each other. One stainless steel Shuber Blade engraved with an Ace of Spades on one side. One stainless steel Shuber Blade blank on both sides. 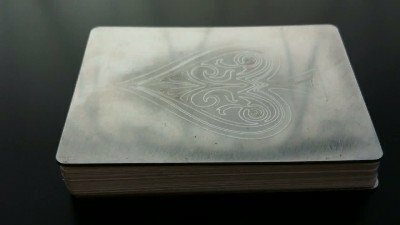 Transform a regular card into a steel plate. Use the engraved Shuber Blade as a card or spectator selector. This blade has a slight bow and freely rotates on a hard flat surface like a top. When the blade stops spinning the tip of the Spade symbol points to the selection. For more ideas with your Shuber Blades see the article The Many Uses of The Shuber Blades. Shuber Blades were first released in December 2011 and were conceived by Dr. Christoph Wasshuber during his quest to improve the common card clip. Lybrary.com is the only authorized retailer to sell the original Shuber Blades .